In this issue: Mercaris to provide price information on country-of-origin coffees to subscribers. Those of you who are regular readers of Mercaris Monthly know that we've been focused on the availability of good market information for organic and non-GMO grains. Beyond identity-preserved grains, however, lies a world of segregated and specialty agricultural crops, each with their own unique supply and demand traits. This month, we’re pleased to announce that Mercaris has begun working to provide better market information for the specialty coffee sector. As always, there’s an opportunity for you to get involved. Before we delve into what we're doing with coffee (besides drinking a lot of it), there are a few key things to note about the sector. The coffee market has undergone an interesting transformation over the last 20 years. In the major coffee consuming countries, highly differentiated markets have emerged for gourmet and high quality coffee, distinct from the instant coffees that formerly dominated the global market. 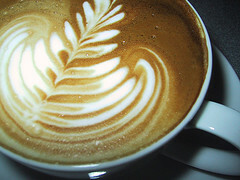 Rather than simply drinking coffee, consumers are demanding Fair Trade, organic, or specialty coffees. 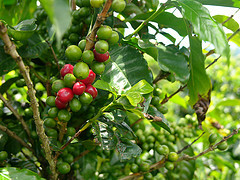 In response, coffee companies are creating beverages with unique flavor profiles and sourcing coffees from particular regions and countries. It’s a trend that looks likely to continue. While the per capita consumption of general, undifferentiated coffees has stayed flat or shown slow growth over the last decade, specialty and certified coffees have demonstrated annual growth rates of between 5 to 12 percent in the U.S. The story is similar in Europe and in parts of Asia. Along with more exacting standards for sourcing coffee comes additional procurement difficulties and risk. Consider this past year, which saw the Central American coffee growing region affected by a tree-killing leaf rust fungus (“roya”). Coffee roasters, exporters, and importers who depend on coffee varietals from El Salvador, Guatemala, Honduras, and Costa Rica will face tighter supplies and higher prices. And of course, the coffee growers themselves have little ability to manage physical risk and may suffer a loss of income. As is the case with many identity-preserved and specialty crops, the existing methods of handling price risk are proving to be inadequate. Coffee has a liquid, actively traded futures market, but in the case of country-of-origin coffees, up to one-third of the value of the coffee is attributable to factors unique to the origination country rather than the broader commodity market (Figure 1, below). 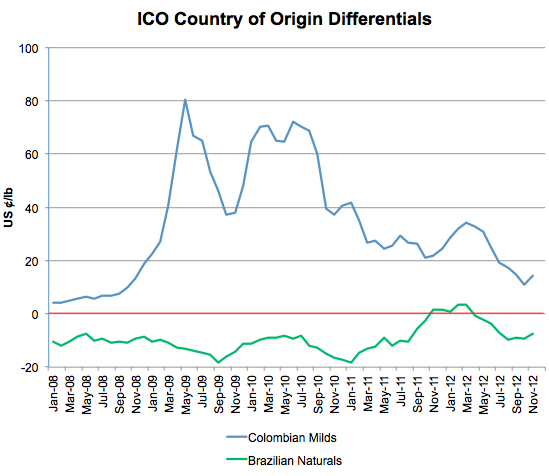 Although the International Coffee Organization (ICO) and others collect prices on single country-of-origin coffees, the general sentiment is that prices need to be collected with more frequency and rigor in order to have the credibility and utility to effectively hedge against price fluctuations on a country-by-country basis. Whether it's a disease, labor shortages, or excessive moisture or drought, the coffee market is vulnerable to shocks that are regionally-based. Because of this, it's important to the industry to monitor and understand how specific country-of-origin differentials change in comparison to the average coffee price. Mercaris intends to fill this informational gap by providing accurate, up-to-date price information on specific country-of-origin coffees to our subscribers, who can then use this data for a variety of purposes, from general business planning to hedging against price fluctuations. Last year, under the leadership of the National Coffee Association (NCA), Mercaris CEO Kellee James and Intl FC Stone Global Director of Soft Commodities Oscar Schaps co-chaired an expert working group on country-of-origin coffee risk. Comprised of a dozen NCA members including roasters, exporters, and importers, the group carefully documented the needs of the industry, developed the economic rationale for collecting better price data, and recommended specialized ‘country-of-origin’ futures contracts for coffee. The results of the committee’s work were presented to the broader membership last month at NCA’s annual meeting and the response was positive; the next steps, of developing better pricing information and risk management tools, are eagerly awaited. As with IP grains, Mercaris is particularly interested in working with industry thought leaders to determine the appropriate methodology for accurate market prices. Beginning this month, we will convene a high level expert working group for coffee comprised of a cross-section of the industry, from growers to roasters, and with representation across coffee-growing regions. Several NCA members have already committed to the new working group, which will be similar to our working group on Grains & Oilseeds. Thank you for reading, and for more information, or to join, please contact Mercaris at [email protected]. Mercaris is looking for people to join our Experts Working Group on Coffee. If you are part of organization that represents coffee farmers, exporters, or roasters and would like to have strategic input and early access to Mercaris information, please email us. We will be attending the above events. Contact us for more information!